A swinging and spinning amusement park ride called the Fire Ball broke apart on the opening day of the Ohio State Fair on Wednesday, hurling people through the air, killing at least one and injuring seven others. Three of the injured were hospitalized Wednesday night, authorities said at a news conference. Two of them were treated and released, but the other remained hospitalized in critical condition Thursday morning. Tyler Jarrell, 18, of Columbus, Ohio, was identified by police as the person killed in the accident. Dramatic video captured by a bystander shows the ride swinging back and forth like a pendulum and spinning in the air before part of the ride flies off, throwing riders to the ground. Sisters Britney and Kiley Neal were next in line for the Fire Ball when the ride broke apart. Speaking to the "Today" show Thursday, Britney said: "The ride was going as normal, then all of a sudden you see people flying out. Then the guy hit the emergency stop button, which made the seat fly off." "The whole row just broke off, and they went flying," Kiley added. In a statement, the Ohio State Fair said: "Our hearts are heavy for the families of those in last night's tragic accident." The fair also said all rides will be shut down until they are inspected by the state, but other activities at the fair will go on as scheduled. "The fair is about the best things in life, and tonight with this accident it becomes a terrible, terrible tragedy," said Republican Gov. John Kasich. 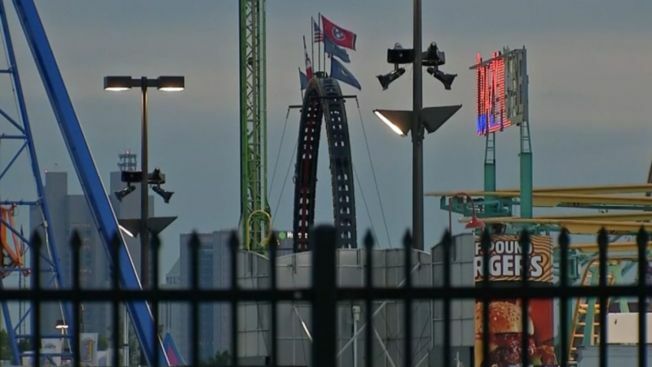 The man who was killed was one of several people who were thrown when the ride malfunctioned, Columbus Fire Battalion Chief Steve Martin said earlier. A company providing rides at the fair this year describes the Fire Ball as an "aggressive thrill" ride. On its website, Amusements of America says that since its debut in 2002, the Fire Ball has become "one of the most popular thrill rides on the AOA Midway." The company description of the ride says it swings riders 40 feet (12 meters) above the midway while spinning them at 13 revolutions per minute. Kasich said he has ordered a full investigation and also ordered that all fair rides be shut down until additional safety inspections can be completed. "Despite this, Ohio will move on. It doesn’t mean we won’t remember yesterday," Kasich said during a press conference on Thursday.